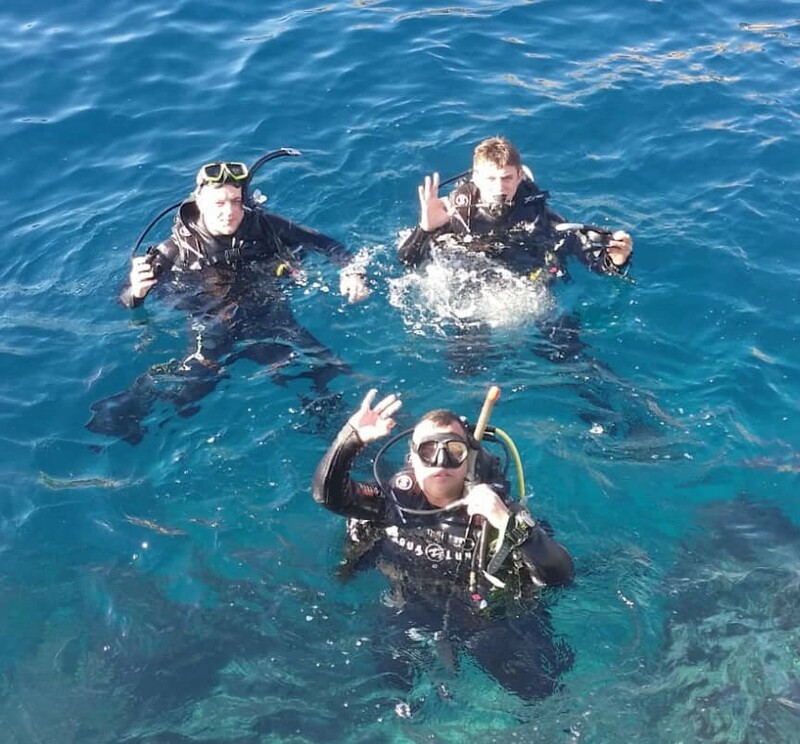 In December 2018, soldiers from 106 Regt RA deployed to Malta on Exercise Cockney Abyss 2 in order to gain BSAC scuba diving qualifications through the MOD Approved Centre Dive Deep Blue. Ninety percent of the team had absolutely no diving experience and were wondering how they would handle the new challenges of breathing, communicating and operating in a totally alien world under water. On the first day of the course we were introduced to our instructors (Amy, Jack and Ossie ) and had the opening briefs delivered about the basic equipment, safety and diving in general. It was certainly an eye opener for me, watching the team struggling with their first test of swimming with a snorkel. When one of the guys asked me whether he should breathe when he was under water, I feared the worse. Would they make it? Were they up to the challenge? How would they cope with learning a lot of new skills with unfamiliar equipment within a short space of time? Diving is not a holiday sport, what looks like a very benign environment can rapidly become hostile and even the experienced can easily succumb to the effects of narcosis. There is a lot to think about even before getting into the water. Have you got all the correct equipment? Is it fastened correctly? Has your dive buddy checked his kit? In the event of an emergency your dive buddy will potentially be your life saver. So, equipment familiarity and functionality were tested repeatedly until it became second nature. The first sessions were pool based where everything from setting up the equipment, basic drills and safety were conducted. This initial exposure to diving was daunting for many of the group, who found the whole experience unnatural. As this was adventure training it soon became apparent that many were having to face big challenges of overcoming their fears and remain calm in their new environment. Many found themselves regardless of their swimming abilities very much outside their comfort zones. The instructors were brilliant, and they needed to be as their patience was no doubt tested as the team grasped the basic skills through repetitive practice and trial and error. Gradually as the day’s instruction went on people began to slowly gain confidence in their equipment and in their new -found skill set. It was a challenging but learning environment. Very soon the team had mastered a variety of essential skills that were used by BSAC divers. Removing their air sources and switching to their alternate air source known as an octopus, a wide range of hand signals generally the only means of communicating underwater. Buoyancy in the water, unmasking drills and others. The practical side of diving was supported by daily theory lectures that reinforced the practical skills as well as giving more in depth diving knowledge and an understanding of how things work under water. 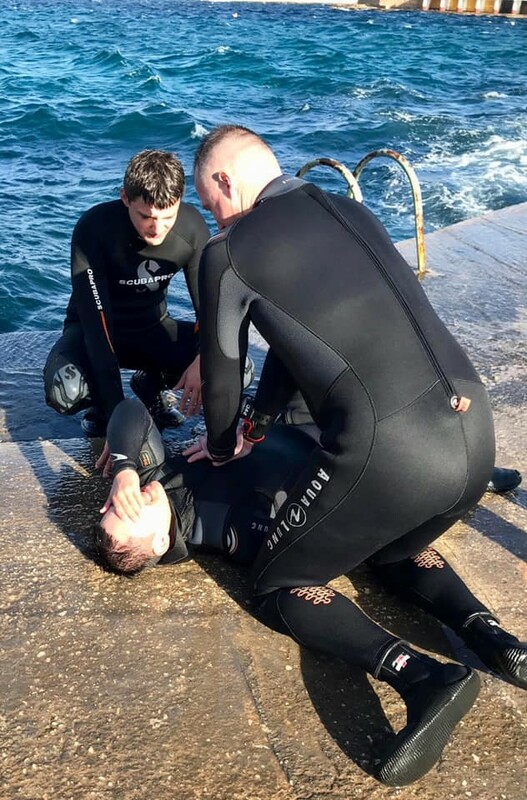 This was useful covering the effects of diving on the body, how to plan to go diving and the things one should think about, what to do in case something goes wrong. The BSAC Ocean Water course is well structured course allowing people to learn at a comfortable pace. A step by step approach that builds an individual’s knowledge and confidence at the same time, followed by a test to reaffirm what has been learned. The team’s first dive was monumental, everyone was nervous and excited as they descended into what for them was the unknown. Would their kit work? Would they be able to equalise? Would they be able to deal with the claustrophobic feeling? The range, duration and depth of the diving increased over the following days of the course from our initial practice dives to diving in wrecks, caves and caverns. Whilst some dives were easy, going from the shoreline, others involved us leaving in boats to other parts of Malta. As the weather changed the sea at times became quite challenging with the waves creating problems for entry and exiting the water. The scenery and the wild life were fascinating. Even though the seas around Malta are not teeming with brightly coloured fish living in coral there was plenty for everyone to be amazed by. From World War Two boats such as the HMS Murray to Italian P Boats the wrecks were fascinating. Then there was the wild life from Moray eels that kept some of the guys up at night wondering if they would be attacked to Octopus, Barracuda and a multitude of other sea life it was a feast for the eyes and sense. Night diving was another whole experience all together with all sorts of different creatures and again the need to learn and utilise another skill set. It called for an increased awareness of one’s location and buddy which was essential as visibility was zero. This was a fascinating opportunity to see the sea at night when it was totally different. We saw shoals of Barracuda coming in to feed on smaller fish, lobsters and Octopus. The floor of the sea covered with sea urchins, quite a different prospect to the day time. We managed to dive a number of famous dive sites as lesser known ones, the Blue Grotto, the Blue Hole, Sirens amongst others. Diving in Malta was an amazing experience and is some of the most challenging adventurous training that the Regiment has done. As a team, we learnt new skills every day, overcoming personal fears and testing our fortitude, ability to take instruction and assimilate information and all this under water in a totally different environment. I saw the soldiers grow both in courage, confidence and ability as individuals and as a team. The opportunity to introduce the members of the Regiment to the world of diving and for them all to complete their BSAC Ocean Diver has been fantastic. This now enables them to go on and develop their skills to the next level, with many of the team keen to gain their Sports Diver and build on their experience. 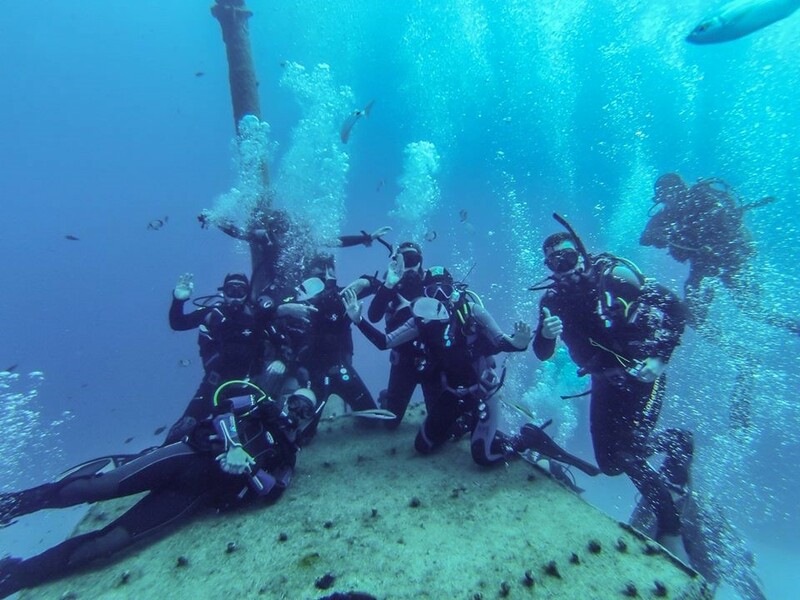 The Regiment hopes to progress these divers and encourage more soldiers to dive with the military through future expeditions.